We visited Athens, Georgia for the first time earlier this month and were able to sample some of the local flavors thanks to the great recommendations of friends! Here's our guide of where to eat in Athens if you're visiting! Since we always try to travel as cheaply as possible while also supporting local businesses, these restaurant recommendations won't break the bank! Before we went to Athens I asked some friends where we should eat in town and got a few recommendations on Twitter for Mama's Boy. He did not disappoint! I had the carnitas tacos with fried eggs, drunken beans, and home fries while Alex opted for biscuits + gravy with french toast + peaches. Parking is a bit difficult and you may have to wait in line, but the service was excellent and the food was even better! We sat outside even though it was drizzling a bit because it was too cool outside not to enjoy the weather. The portions were huge for the price. We probably could've just split one item. I don't even think I ate half of mine. We've had 1000 Faces coffee before because it's sold at Vortex Doughnuts in Asheville, but this was our first time at their home base. Their menu is pretty standard but the folks there obviously care a lot about the craft. I ordered a latte with dairy-free milk and Alex had a pour-over. It's a hip place with an industrial vibe (especially since it's next to train tracks) that would be the perfect place for a business meeting or just catching up on some reading! We tend to shy away from chain places unless they're something we don't have at home. The awesome staff at Half-Moon Outfitters in Athens recommended this spot for tacos since they're conveniently located next door. We ordered at the counter and sat outside on their open-air patio. There were a lot of college students there at the same time! I was expecting the salsa trio to be a lot smaller. It was way too much for just two people but it was absolutely delicious. I had the Carnita + Fish tacos with Rice and Alex had an Enchilada with a Refried Bean taco. The food tastes about what you'd expect from any Mexican joint but overall it's a great spot for a casual lunch! It happened to be Creature Comfort's annual fall festival when we were in town so we stopped by to listen to some music and check out the artwork from UGA's printmaking studio students. Thanks to some Georgia beer law changes, you can buy beer directly from the brewery instead of having to pay for a tour/tastings. I had the Tropicalia, which I love for its citrus flavors despite not typically being much of an IPA drinker! Creature Comforts is definitely a hoppin' spot for groups to hang out. There were lots of dogs too! We made sure to pet them all. 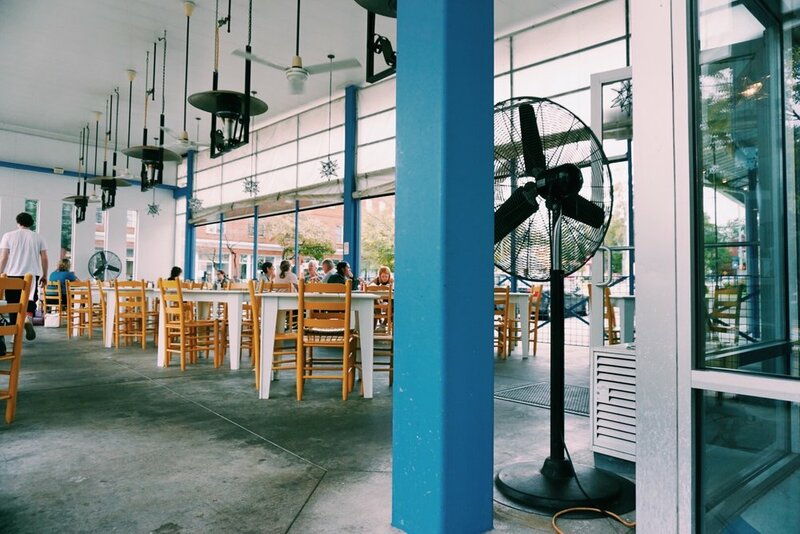 I totally neglected to get any photos of our dinner at Seabear Oyster Bar but it was one of those places where you're too busy enjoying the vibe to worry about anything other than living in the moment. Our friend Brooks recommended Seabear and at first glance I gave it a pass, thinking it would be too expensive. I'm glad it was so close to our hotel because when we looked over the menu, we were sold! The prices were much more reasonable than what you'd expect from the atmosphere. We enjoyed a cozy dinner by candlelight. The space is relatively small which made it a bit loud to hear over Cheryl Crow's slow jams inside, but they've got a great patio that would be perfect on a cool evening. Everything we sampled was delicious! We started with frozen negronis, steamed buns, seared okra + tomatoes, and oyster crackers that reminded me of the ones my grandma used to make. Alex sampled a few oysters for his meal and I had the shrimp and grits. The portions were just the right size for the price without being too much to eat at one sitting. Do yourself a favor and take your date here next time you're in Athens!